The Leaning Tower of Pisa is definitely one of the most recognizable symbols you can easily identify Italy by. Docking in a cruise port so close to where it's at, it is only natural you would think of getting to Pisa to see this amazing building as well as all the others in the Piazza dei Miracoli. 5) Getting on a bus from Livorno to Pisa which turns out to be one of our readers favorites as it is as simple and convenient as shore excursions but much, much more affordable. What is most imporatant for you as a cruiser is that there is actually a special bus line organised for cruisers wishing to visit Pisa. 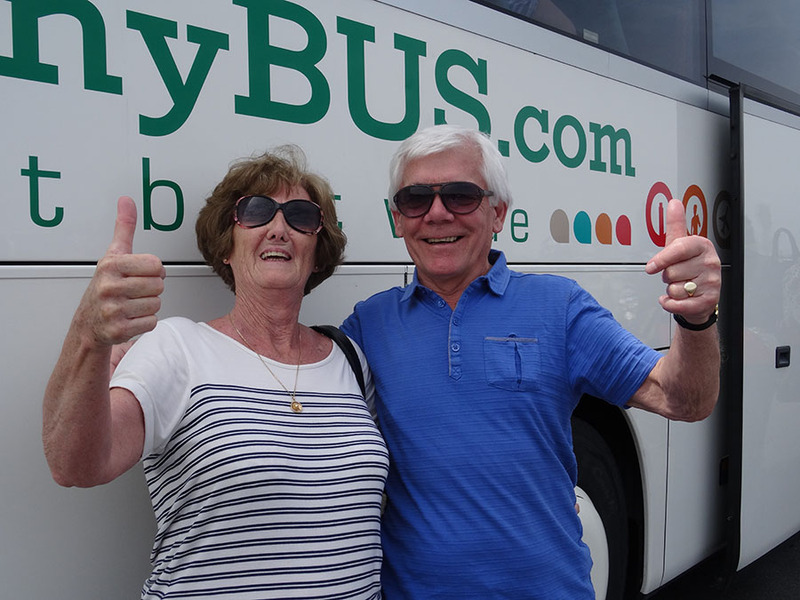 Namely, there is a company in Livorno, Tuscanybus.com that offers this specialized bus service for cruisers and is winning the fantastic four-and-a-half star reviews on Tripadvisor for it! 1) Just like with taking a Tuscanybus.com to Florence, when getting from Livorno to Pisa, first you need to get on the Livorno port shuttle bus that takes you from right in front of your cruise ship's gangway to the centre of Livorno (Via Cogorano). If you have had a chance to read our Florence transportation pages, you will know it is impossible to walk from your cruise ship to the center of Livorno. The cruise ships dock on the inside of the big industrial port of Livorno and are cut off from the town itself. It wouldn't only take you very, very long to walk through that port...it is also dangerous as there are no pedestrians' walkways at all. That is why you just need to get on that Port shuttle bus. The charge is about 5 euros per person round trip and most cruise lines will make it possible for you to purchase the tickets on board. If you forget to do it ahead of time, they will charge your cruise card on the shuttle bus itself. The first shuttle departs once the ship is cleared by the local authorities and as soon as it fills up with the independent travelers trickling off the gangway. Which doesn't normally happen before 8am. 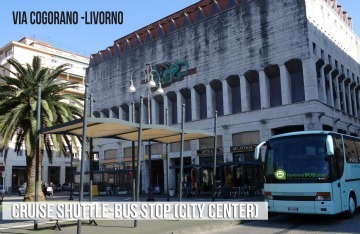 The Port shuttle bus will drop you off right behind Livorno's Piazza Grande, in Via Cogorano, just a few steps away from the Tuscanybus' coach stop. That is the bus that will take you from Livorno to Pisa. 2) When you get off the port shuttle bus you will recognize the TuscanyBus coach by the company's logo on its side and there will also be a friendly company representative waiting for you. I wholeheartedly suggest booking your seats ahead for one reason: there is only one Tuscanybus going from Livorno to Pisa at a certain time and you don't want to miss your opportunity of this low cost transfer to Pisa. If you do, you will have to run/wait for the next train or bus and possibly wait for hours before its departure. Something you just cannot afford on this short day. Once you book your spot on the bus ahead, your seats will be waiting for you with your name on it! So regardles of how many eager fellow passengers want to get on the bus right there on the spot, you will be safe. Of course, the tickets from Livorno to Pisa can be booked and paid for online. Cancellation is free for up to 48 hours before the day of travel. Should your ship miss the port due to bad weather, you will be refunded your money, no questions asked. a) The first bus departs Livorno at 10am – arrives to Pisa 10.40am. It gives you one hour and twenty minutes in Pisa and departs Pisa at 1pm. It arrives back in Livorno at 1.40pm. Please note that, in order for the company to handle passenger numbers efficiently, passengers must choose one specific round trip and cannot travel back at a different time. Which means you cannot take the first bus from Livorno to Pisa and extend your stay in Pisa hoping to catch the second or the third going back. In Pisa the bus will drop you off at “Parcheggio Pietrasantina”, 700 meters from the Miracle Square. From there you can either walk for 10-15 minutes or pick up the shuttle bus (1 euro round trip) which takes you to Piazza dei Miracoli which is where you will see the majestic Cathedral, the Baptistery and its bell tower, better known as the Leaning Tower of Pisa. If you think your stay in Pisa is short, let me just tell you this: Pisa is all about the Pisa Tower and the other wonderful buildings in the Piazza dei Miracoli. Besides that, there is nothing much to see, do or enjoy in Pisa. That is why, especially if this is your first visit ever to Tuscany, everyone will suggest you'd rather do both Pisa and Florence in a day. If you've been to Florence before and insist on going to Pisa only, keep in mind it's better to have your lunch and do your shopping once you return to Livorno. Restaurants around Piazza dei Miracoli are very touristy and they offer overpriced food of questionable quality. I had lunch there once, with the view of the Duomo and the tower...and I regretted doing it. Also, besides the little souvenir mom and pop stores, there are no other shops nowhere nearby. That is why an hour and twenty minutes are more than enough for walking around the Campo dei Miracoli, taking photos and getting a few souvenirs. To book your bus tickets from Livorno to Pisa use the form below. Normally, the Tuscanybus buses depart on every date a cruise ship is in port but do mention your exact date to double check. Have a fantastic day in Pisa, or both Florence and Pisa!